NOAA has upgraded their watch for geomagnetic storms on Oct. 7-8 from G1 (minor) to G2 (moderately strong). This is in response to a stream of solar wind approaching Earth from a large hole in the Sun’s atmosphere, described below. Arctic auroras are almost certain to appear when the gaseous material arrives, and the light show could descend to northern-tier US States such as Maine, Michigan, and Washington. 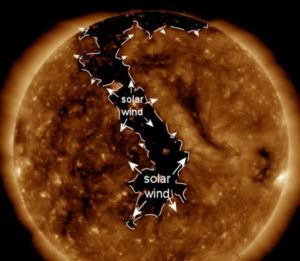 Coronal Canyon Faces Earth: A large canyon-shaped hole has opened in the Sun’s atmosphere, and it is directly facing Earth. NASA’s Solar Dynamics Observatory took this false-color ultraviolet image of the structure on Oct. 5th. This is a coronal hole–a place in the Sun’s atmosphere where magnetic fields open up and allow solar wind to escape. Coronal holes are common, but this one is unusually large. It stretches more than 900,000 km from the Sun’s north polar crown across the equator into the Sun’s southern hemisphere. Now that’s a grand canyon. The emerging stream of solar wind will reach Earth on Oct. 7th bringing a 75% chance of minor G1-class geomagnetic storms, possibly intensifying to G2-class on Oct. 8th according to NOAA. Such storms can affect migratory animals that use magnetic cues for navigation and spark auroras visible in the USA as far south as a line from Maine to Washington.